The hacking is now over. Participants are gathering in the conference room to pitch their ideas to our panel of judges. A couple of groups are still on their laptops, while our dear Robin introduces the session. The format is 5 minutes per presentation, everything's allowed. On top of that, there will probably be some questions from our judges. 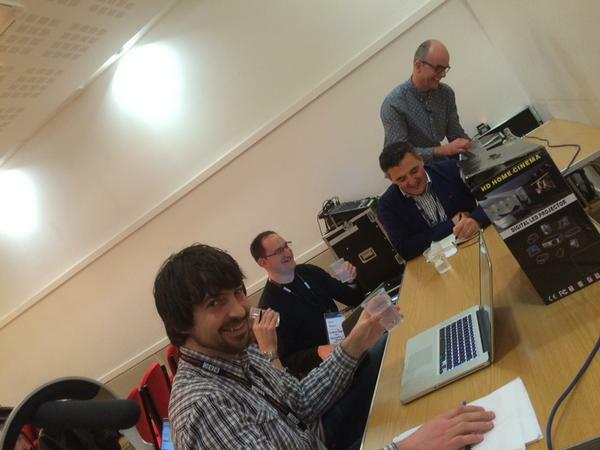 And some beers at the end, once our diligent panel of judges made their decision. After mentioning that their uni's the best because hills, beach, and booze, the team points out that young people usually don't consume the news, for quite a lot of reasons: intimidating, daunting. They want to remove that risk and let you personalise your news feed. They show an example of this sort of feed, from a university student interested in music and entertainment, and less in scary and sad stories from abroad. The users can register on the site, and fill a questionnaire for the prototype to better understand your interests and topics you want to follow, but also say that you don't want to see. Once filled in, the user's taken back to the news feed, search the tags and show you the most relevant. Should you dislike a news item, you can remove them from the feed. They demo the homepage, made of live tweets, weather, and creative content from the BBC, as well as (music) events coming up. All the music bit is powered by LastFM API, which shows artists liked ans listened by the user. In terms of geolocation and local content, several locations can be provided, in order to keep up with your home-town as well. To make it more specific, Cambrian News has agreed to provide access to their content. "How do we know if a story is interesting?" Today, it's the editors and journalists' job. #AskBBC will put this decision into the hands of the public, by giving them the oppportunity to pitch local and national stories to the BBC itself, in the form of a question. The popularity of a given question will be shown by the number of votes it receives. The decisions taken on this basis will generate more locally relevant stories, helping to build the trust between the viewer and the editors. 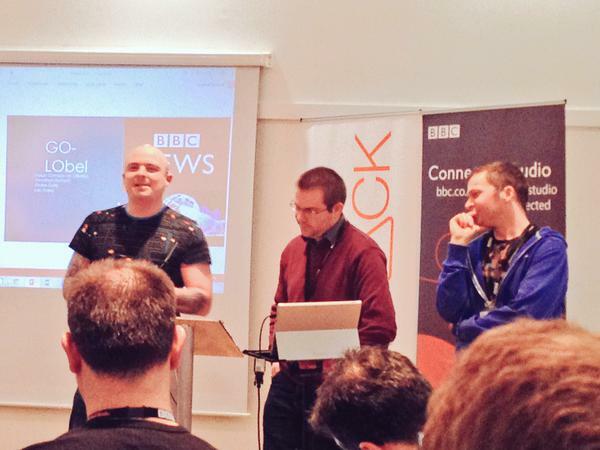 Questions taken up and reported by the BBC will contain a link for anyone to access the news. Using webcams, users will record questions and send them to the BBC for usability (it is to be noted that the questions will go through a filter to prevent abuse), and then be published on the BBC website. The licence will allow other publishers and readers to re-publish this content, provided they mention the BBC as content creator. Some precedents in France (Le Monde) and the US (Chicago local papers) are mentioned by the team, which urges the BBC to give more power to its readers and viewers. They start the presentation by asking the audience to tweet what appears to be a BBC News URL... more on that in a second. 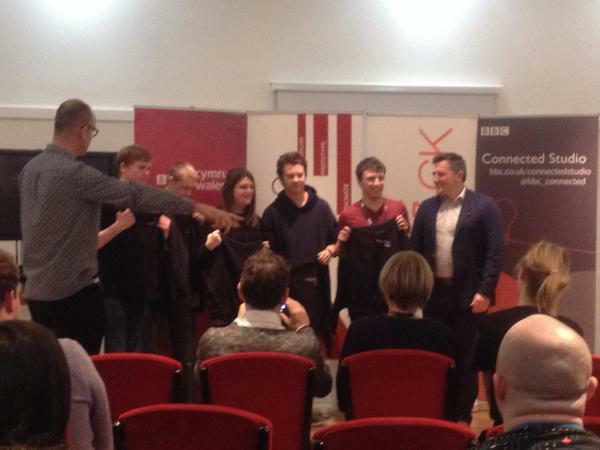 Once again, this team combines students from Creative Writing and Computer Science background. Maybe local news isn't what's happening around you, but what people around you are talking about. They then went on a feed of news being talked about around you. All tweets containing news in a certain perimeter (defined by the reader) are ingested by their app, which targets younger audiences - but not only. These tweets are scanned for URLs contained by the Juicer API to grab the content which is going to be re-formatted. 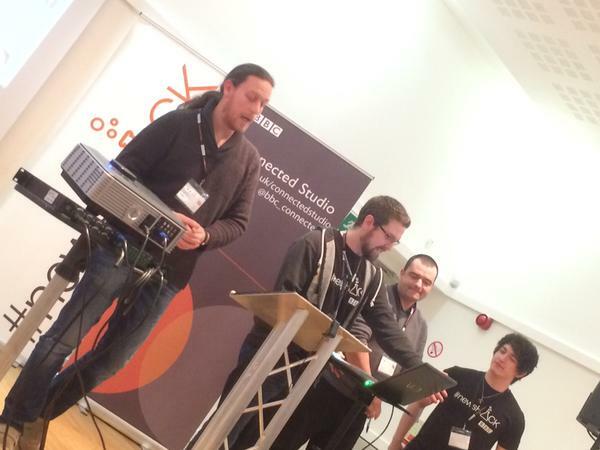 The end result is BBC Village, their website, that they bravely demo-ed live, as well as the behind-the-scenes code. And finally, Bangor Team B is up to conclude our presentations! 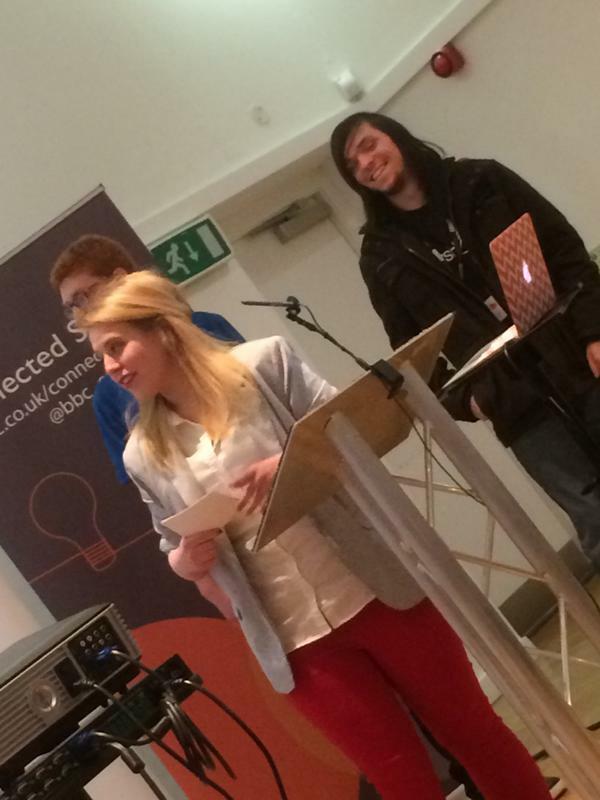 Their idea came from browsing for long hours clunky students papers and local events websites. 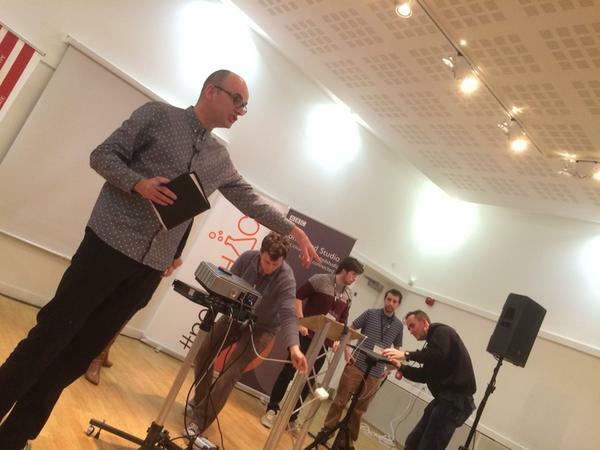 Could you centralise all that in one app? Yma Rwan ("here, now") app uses your location to give you the newest and anything of interest currently available. "You see it, you share it, you speak it." Davette, their non-gendered persona, wants to know about a bunch of things around, and will use Yma Rwan to check the news and features, find out what the next conversation is going to be, maybe become a moderator of some of them. Convenience, dialogue, individual-centric perspective, and moderated discussions are all in one place. Using geo-location of the device, it grabs news stories in the area, and shows you your feeds, DBPedia custom searches for news articles based on concepts. Each article has a unique hashtag that can be then used to aggregate the discussion. 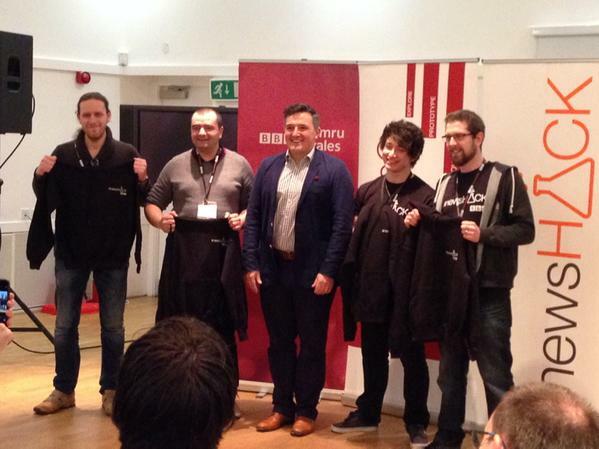 Awards at the @bbcwales #newshack. 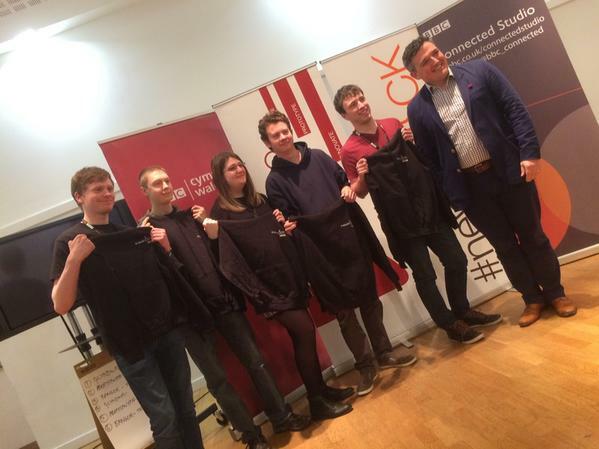 The @abercompsci teams did absolutely great work - definitely the best technically. The results are in, and we gathered the participants again for Robin Pembrooke to announce the winners. For the SURPRISE Category, we selected Bangor Team A. Special congratulations for the OVERALL WINNER of this NewsHACK North Wales: //No Comment! Thank you all so much for joining us and participating, it was a great couple of days, with a huge amount of creativity. That's all for this event, we're adjourning to the beers now. Thank you!